I’m a self-taught mixed media artist, One Stroke Certified Instructor, and crafter of all sorts based in New York City. I'm happy just to be able to render all the subjects I love but especially Sweet and Cute Girls, Animals, Fantasy and Whimsical Art, as well as all kinds of decorative painting. I find inspiration in everything around me. The beauty of nature, an exceptionally gorgeous sunset, the feeling of the wind brushing against my face, the music of my most beloved musicians and composers, the art of my favorite artists, a smile in the face of my son, something silly my dog’s done and even in the most mundane of activities such as watching suds forming on the surface of a dish I’m washing. Inspiration is everywhere, in everything, all the time if only we allow ourselves to be open to the beauty and poetry of evertything around us. My Fine Art Paintings, Pet Portraits, Fantasy Art Illustrations, Miniature Art and Decorative items have been exhibited a number of times in New York City and can be found in private and corporate collections around the world. 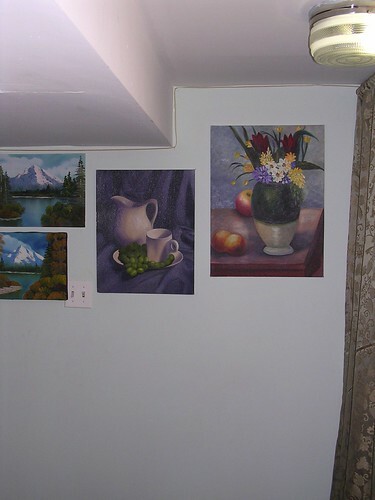 Still Life and Landscapes Wall, originally uploaded by Jade Erin Scarlett, OSCI. This is a Flickr badge showing items in a set called MIXED MEDIA AND COLLAGE. Make your own badge here.